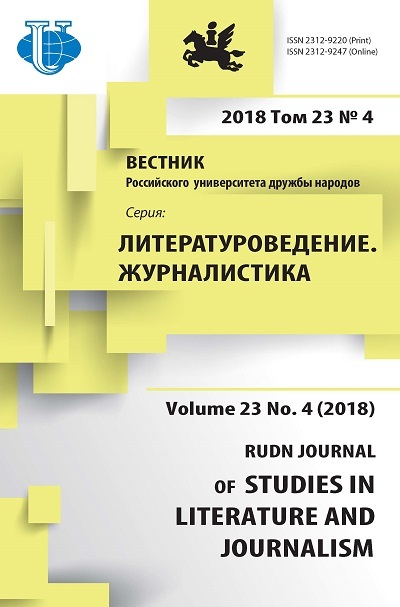 The aim of the journal is the scientific exchange and cooperation between Russian and foreign scientists, publication of research results on a wide range of actual problems of Philology and journalism, coverage of scientific activities of the professional community of literary scholars and journalists. Priority areas include modern and classical literature, theory and history of journalism, mass communication. The journal publishes articles, papers and reports as well-known Russian and foreign scientists and young specialists, postgraduates and doctoral students, as well as reviews, reviews, information on scientific projects. The materials are published in Russian and foreign languages. Bulletin is a quarterly issue. 500 copies. Paper version available. The information about all the articles published is archived in Russian Electronic Scientific Library (eLIBRARY.ru). The direct URL to the journal issues: http://elibrary.ru/contents.asp?titleid=25713. You can search through article metadata (title, author, keywords, abstract etc.) on eLIBRARY.ru. The URL to article’s full text is available on the article’s page on eLIBRARY.ru. The articles’ full texts are stored on the journal’s server and can be accessed through this page (http://journals.rudn.ru/literary-criticism/issue/archive) or from each article's individual page on eLIBRARY.ru.